22:22: Who Are You Anyway? Today’s question is: When someone is trying to convince you of something (like you should exercise regularly) are you more likely to be persuaded by emotion/peer pressure/passion or by good solid facts and figures? 25:47: What Are You Diggin’ Lately? I’m diggin’ Notes from the Universe which are free personalized reminders of life’s magic and your power. Jenny is loving coconut oil as a makeup remover. 31:10: You Win or You Learn: My Win has to do with being prepared for this episode’s book report and Jenny’s learn is a bit of a throwback to when she wasn’t feeling well for the recording of last episode. Facebook Group: Share your workouts here!! 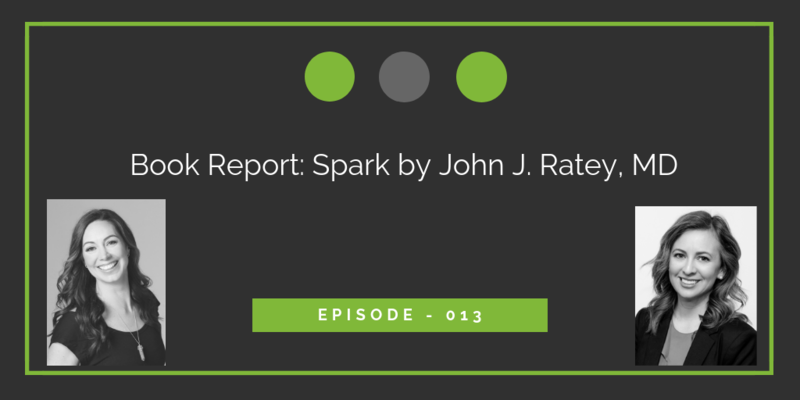 Book: Spark by John J. Ratey, MD. In Spark, John J. Ratey, M.D., embarks upon a fascinating and entertaining journey through the mind-body connection, presenting startling research to prove that exercise is truly our best defense against everything from depression to ADD to addiction to aggression to menopause to Alzheimer’s. What was your biggest takeaway or insight from this episode? Did you read this month’s book? If so, let us know what you thought about it! Post your daily exercise this month or give us your take on the book on the socials using #theimprovementproject. I’m on Instagram and Twitter and Jenny is on Twitter. We also have a Facebook group. Come over and ask to be added to the group to join in on the habits conversation! This month, I’ll be posting my daily workouts here and I’d love to see yours too!